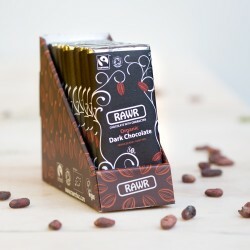 Kendra and Orya from Rawr are devoted to making chocolate with the highest quality raw, organic ingredients around. Every ingredient and even their environmentally friendly packaging is carefully sourced. 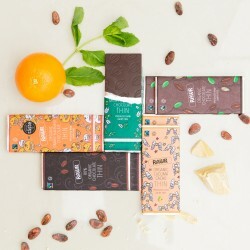 In addition to realising the full benefits of raw cacao their chocolate is completely dairy-free with no added refined cane or beet sugar, no hydrogenated or chemical preservative nonsense, no emulsifiers, and no colourings. 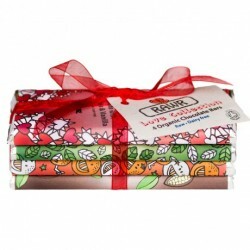 Completely raw cacao, completely yummy...are you ready to Rawr?! 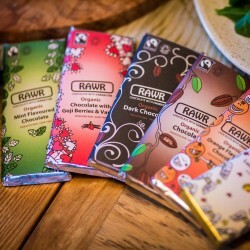 The nations top food bloggers are resounding in their praise for Rawr with soundbites including "luxurious and strong, with a real depth of taste", "I've tried most brands and flavours of raw chocolate that are available in the UK...so believe me when I say that this chocolate is incredible", "If you haven't tasted raw chocolate before, then this is the best place to start".